"You pays your money and you takes your choice". The saying, incidentally, was used by Mark Twain in 1884, at the end of chapter 28 of ''Huckleberry Finn". Applying it to the modern day, you can read the BBC and it will tell you: "Swedish expert offers post-Brexit Irish border solution". The gist of the story is that, according to customs expert Dr Lars Karlsson, there is a technical solution to keeping an open border in Ireland after Brexit. Go to the Belfast Telegraph and you will get much the same story: "No physical border possible, customs expert tells MPs". This is a reference to Karlsson's evidence to the European Union Committee yesterday. It is possible to have no physical infrastructure on the Irish border after Brexit, he says, but only if the political will exists in a best-case scenario. But, if you end up with the Irish Times, you get a different spin. The headline declares: "Post-Brexit Border unlikely to be frictionless, Swedish expert says". And this time we have Karlsson conceding that "crossing registration and CCTV" – required for some versions of his border scheme – are "too much" for some. For the sake of completeness, though, this is the option preferred by Snake Oil Singham, who endorses Karlsson's report written for the European Parliament in November 2017, with the somewhat wordy title: "Smart Border 2.0 Avoiding a hard border on the island of Ireland for Customs control and the free movement of persons". 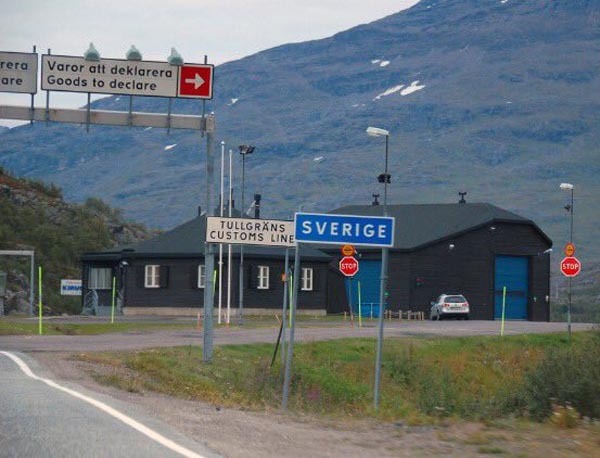 Says Singham: "It will be hugely beneficial to have a bilateral border process in operation, as is the case in the Norway/Sweden border, and as described in the 'Smart Border 2.0' report for the European Parliament by customs specialist Lars Karlsson". And, of course, Karlsson, president of KGH Border Services; Former Director of the World Customs Organization and Deputy Director General of Swedish Customs, is the expert. He has that perfect combination of a gold-plated cv, years of experience and all the prestige you could ever ask for. But he is also the classic example of the narrow subject specialist, so constrained by his own discipline that he is totally blinkered, knowing nothing of the world outside his domain. As a result, although he delivers his evidence with enthusiasm, confidence and enormous authority, when it comes the Northern Irish border, his report is of next to no value. What is extremely unhelpful about his work is that it looks at the customs issues, reflecting his blinkered approach to the subject. He is, after all, a customs specialist. But, despite the manifest inability of so many to appreciate the reality, there is a great deal more to border controls than just customs. Not least, and by no means exclusively, there are the all-important "official controls" covering the movement of animals and foods of animal origin – the so-called sanitary controls, requiring veterinary inspection at Border Inspection Posts (BIPs). Fish and fish products also come under the official controls, requiring a separate breed of food inspector to monitor them. Separately, there is the huge raft of phytosanitary controls, from plant health certification, to the monitoring and certification of timber products – including the ubiquitous pallets used to transport goods – and foods of plant origin: fruit and vegetables, but also nuts, spices, cereals and much else. Throw in animal feed and you have a huge range of goods, most of which must go through what are called designated points of entry. Yet, in Karlsson's report, you will see is only one, incidental reference to phytosanitary requirements, no reference to sanitary controls, not a single reference to border inspection posts or designated points of entry, no reference to the EU's "official controls" and no mention of veterinary inspections. As we well know, by far the greater proportion of vehicle inspections are required for sanitary and phytosanitary purposes, respectively in Border Inspection Posts and Designated Points of Entry, where presentation is mandatory before the goods can be submitted for customs clearance. The system is entirely separate from customs, and their officials take no part in the process. In his report, Karlsson takes a special look at the Sweden-Norway border, offering the border control system as the starting point for a more comprehensive system. Using the best of available technology and systems, grafted on to the Sweden-Norway system - he believes we would provide a frictionless border between the two Irelands. But, with the focus entirely on customs, he fails to take into account that both countries are in the single market, one in the EU and the other and Efta/EEA state. Both adopt internally the "official controls". Therefore, neither country treats the other as a "third country" and there is no application of official controls at the border, and no requirement for phytosanitary controls. Nor are these minor or incidental omissions. Karlsson is clearly out of his depth. In his evidence to the select committee yesterday, he talked about "trusted trader" schemes to deal with agriculture. In slightly more detail, he tells the Irish Times that: "Checks under sanitary rules, a key regulatory area for agricultural trade, could be covered under the trusted trader arrangements". Clearly, the man has no knowledge of non-customs systems. The AEO "trusted trader" certification is a customs system and has no bearing on sanitary or phytosanitary issues. The EU does not operate a preferential access system to BIPs and DPsE and, under WTO rules, they are required to give access on the same terms, in a non-discriminatory manner, to all third country users. Then, crucially, this does not get past the central problem that the facilities do not exist at present and, should they be provided, they would constitute hard border infrastructure, confounding the pledge to avoid this. The very requirement means that there will be a hard border. Mind, if Karlsson gets it wrong, he is not alone. Shanker Singham, the self-appointed expert in all things to do with trade, goes spectacularly off the rails, drivelling about mutual recognition (of both regulations and conformity assessment) for meat products and animals, ignoring completely the existence of official controls. At the stroke of a pen, so to speak, Singham invents his own private, unique world where over fifty years of community legislation and the entire food control acquis disappears in a puff of smoke, miraculously paving the way to a frictionless border. Failing this, he asserts that that the EU "has a formal Mutual Recognition Agreement with New Zealand that lists a number of sanitary measures in animal health and animal derived products where the parties have agreed recognition of equivalence, and associated reductions in border checks". He also assets that "CETA also includes a protocol in similar terms". In Singham's miraculous little world, therefore, for the UK and EU "it would be reasonable to expect, at least while the respective regulations are still harmonised, to recognise not just the regulations but also the testing and enforcement regimes and thus avoid the need for controls at BIPs". Here, for a start, Singham confuses the entirely separate concepts of "mutual recognition" and "equivalence". In terms of errors, this is akin to a car mechanic looking for the carburettor in a car fitted with fuel injection. It is a rookie mistake which rules out any claim to expertise. This is a man who simply has no idea what he's talking about. For sure, the EU and New Zealand have an agreement which allows for "the progressive recognition of the equivalence of sanitary measures", but that in no way exempts imports of New Zealand produce from being presented at BIPs. They must go through the system just like produce from any other third country. For sure, New Zealand enjoys a reduced inspection rate, as low as one percent for physical inspection of lamb carcases. But, as I explain here, that is a special situation. Lamb is considered to be low risk, and a "high purity" inspection system applies to New Zealand produce, something that few UK abattoirs could replicate. And, with their more complex disease patterns and involvement in a wider range of zoonoses, such low inspection rates would never apply to cattle and pigs. Thus, when Singham asserts that "CETA also includes a protocol in similar terms", he is just plain wrong. Canada "enjoys" inspection rates of 10-15 percent, against the normal requirement of 20 percent. And all produce has to go through BIPs. But, God help us, this is what represents state of the art knowledge amongst the chatterati. Whether Karlsson or Singham, you have the blind leading the blind, spectacularly misleading spoon-fed MPs who haven't the wit to find out for themselves that they are being led astray. And it doesn't even stop there. Even in Karlsson's specialist area, he gets it wrong. In assessing customs requirements, he takes no account of the fact that inspection frequency is based on risk assessment - a legal requirement under the UCC. He only makes one reference in his entire report to risk assessment. But what needs to be considered is that the Swedish/Norway border is a very stable, longstanding system, where the parameters are well understood. With a new border between the north and south in Ireland, in the absence of experience and a lot of new systems in place - with plenty of people prepared to exploit any gaps - the border might be considered high risk - and for some years. Therefore, assessments of rates of customs inspections might be grossly under-represented, as is the resource requirement. But if we can't get past these basics, there is no hope for us. In the hands of the ignorant, any idea of sensible planning goes out of the window. We are looking at fantasy worlds that simply don't exist, with the debate going round and round in circles – getting absolutely nowhere.